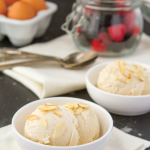 A creamy, dairy-free, sugar-free take on classic vanilla ice cream, sweetened with xylitol and keto-friendly! 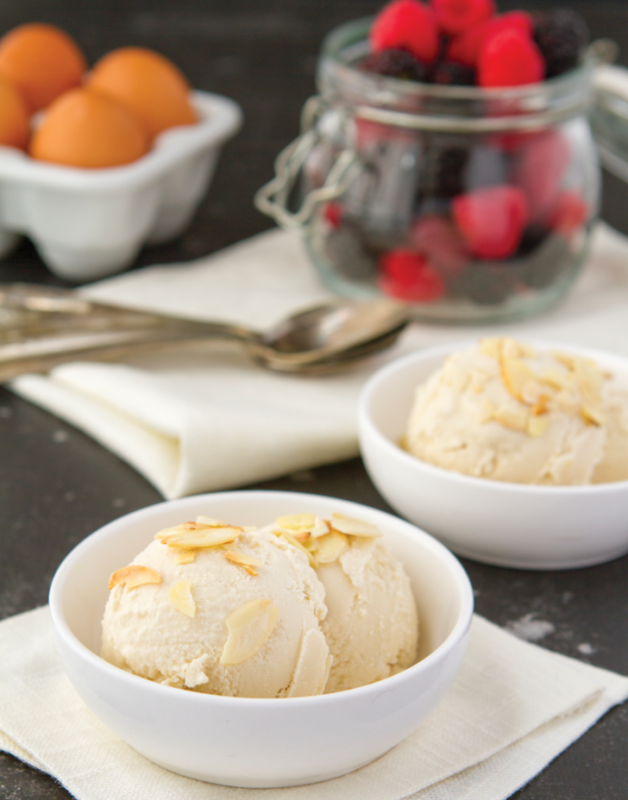 This recipe can be made with or without an ice cream maker and topped with roasted almonds, macerated strawberries, added to a stevia root beer for a keto root beer float, or enjoyed on its own. Place an airtight, lidded 32-ounce (950-ml) or larger freezer- safe glass container, loaf pan, or bowl in the freezer. Place all the ingredients in a blender and blend on high speed until smooth. Transfer the mixture to an airtight container such as a mason jar and place in the fridge to chill for 2 hours. Once ready to churn, add the mixture to an ice cream maker and churn following the manufacturer’s instructions. Transfer the churned ice cream to the chilled container (if using a loaf pan, line it with parchment paper first). Cover with the lid and place back in the freezer for at least 11⁄2 hours before serving. When ready to serve, set the ice cream on the counter to soften for 5 to 10 minutes. Garnish each serving with a teaspoon of roasted almonds, if desired. I’m sharing this recipe from page 410 of my paperback, The Keto Diet, because it’s a must for hot summer days. If you don’t have an ice cream maker but you do have patience, any ice cream recipe can be made with a large bowl, a fork, and a blender or food processor. After preparing and chilling the ice cream mixture, pour it into a large bowl. Place in the freezer for 30 minutes, stir with the fork, and repeat until the mixture is hard yet still mixable. The length of time this will take will depend on the volume of the mixture—this recipe makes 3 cups, so it’ll take about 3 hours to set and 6 stirs. If the mixture has hardened too much, you can transfer the chunks to a high-powered blender or food processor and pulse until smooth. Just don’t let it turn into an ice cube or it will be very difficult to revert to ice cream. Store in the freezer for up to 2 weeks. Prep ahead by blending the ingredients and set in the fridge up to 2 days before churning. Make it nut-free by omitting the roasted almond topping.